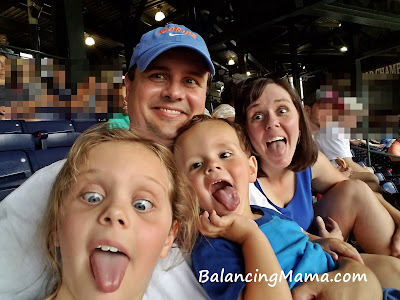 I am an Atlanta Braves Blogger, and my family was hosted at Turner field for an Atlanta Braves game. All opinions are my own. 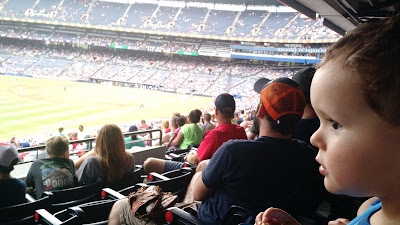 I took a two-year-old to an MLB game - and survived! 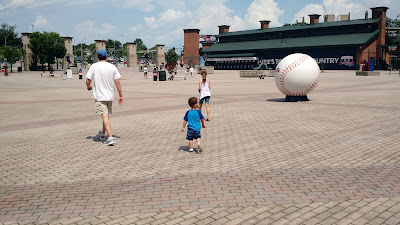 I was unsure about bringing a young and extremely active boy to an Atlanta Braves game during his nap time, and my mama-anxiety was in top form preparing for the event. I traveled to Turner Field equipped with games on my cell phone and a fully charged battery, extra 2T clothing for unexpected messes, and a pouch of his favorite fruity-flavored applesauce. We didn't need any of it! The Atlanta Braves game was a lot of fun for my entire family. Both of my children, ages 8 and 2, were interested in the game and watching the crowd via the jumbotron. Occasional inter-inning races and games were hilarious; one child cheered on the giant Home Depot bucket and the other laughed at the Home Dept hammer mascot as they raced and pushed their way to the finish line after the 4th or 5th inning. The little guy also took several turns in the Scouts Alley "bullpen", showing everyone his arm. We ate frozen yogurt out of the most adorable Atlanta Braves batting helmet bowls, waved down the concessions guy for some popcorn, and clapped along with the crowd when a couple Braves managed home runs. The toddler, by the way, passed out in the car within moments afterwards. Mama score. We will go back again - hopefully soon! 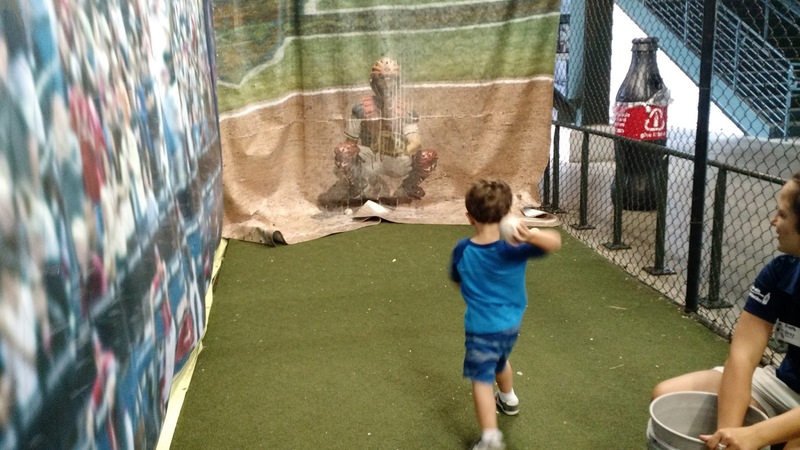 Bring your kids to a Braves game! Right now, you can sign your children up for the Atlanta Braves Kids Club and receive two free tickets to a remaining home game (with few exceptions) for all members of the Braves Kids Club, presented by Chick-fil-A. There are two membership options. Both the premium and free memberships include a BOGO (buy one, get one) ticket offer and a Braves Passport where members can earn prizes for attending home games. The premium option also includes a meet-and-greet with the Home Depot tools mascots, a Freddie Freeman Kids Club jersey, drawstring bag and wristband, free admission to the Braves Hall of Fame, and more. This season marks the final one for the Atlanta Braves at Turner Field. The Braves will be moving up I-75 to the brand new SunTrust Park in Cobb County for next season, so it was important to us to bring the children to Turner Field this time. Turner Field is an impressive stadium with history from the 1996 Olympic Games and a lot of interesting things to see and do. Check out this article: 101 things to do at Turner Field for a really great list! We are happy to report that we witnessed a 5-2 win over the Mets yesterday. Let's go Braves! Linked up to Mommy and Me Monday with Really, Are You Serious. The pic above has to be my new family photo. So "us"!